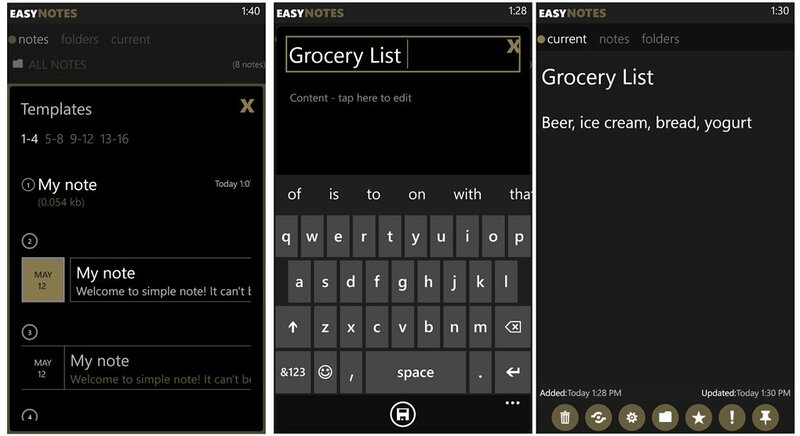 EasyNotes is a fairly simple note app for your Windows Phone 8 device. EasyNotes isn't a note taking app per say but rather a feature rich app to create sticky notes or reminders. 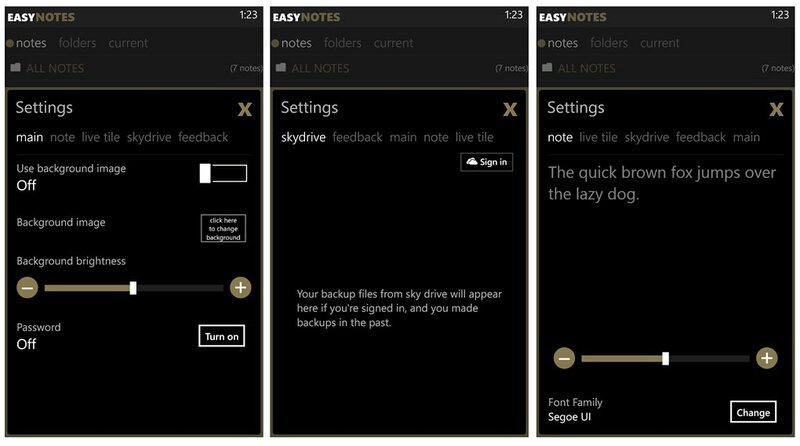 Notes are highly customizable from fonts, background image, sharing and they can also be backed up/restored to Skydrive. EasyNotes is a nice app if your constantly creating reminders or notes for everything from grocery/shopping lists, to-do lists, or anything else a gentle reminder will keep you out of the doghouse. The main page for EasyNotes has three views that includes all your notes, your note folders, and your current note. At the bottom of the main page includes button controls to add a new note (or create folder depending on which view you're on), edit an existing note, change the layout of the main page, and access the settings. You have sixteen options for the main page layout ranging from tile view to list views, all of assorted shapes, sizes and colors. EasyNotes settings cover turning on/off background images, setting a password for the app, changing the note font style and size (unfortunately no Comic Sans), Live Tile options, Skydrive setup and feedback to the developer. Up under the three-dot menu on the main page you'll find sorting options (title, dated added, date updated) and access to EasyNotes templates (over ten of them). Creating a note is simple, tap the "+" button on the main page, enter your note title and content. As an alternative you can access EasyNotes' templates and just fill in the blanks. Once a note is created it's added to the "All" view on the main page. Tapping on an individual note pulls up the note and a handful of options that line the bottom of the screen. These options include deleting the note, sharing the note (email, text, posting to Twitter), access settings, move to a folder, mark as a favorite note, mark as important, and pin the note to your Start Screen. 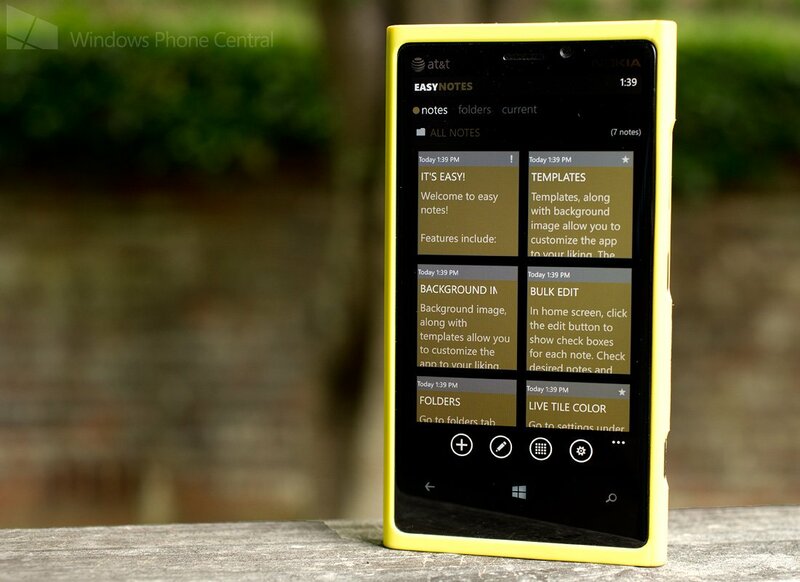 EasyNotes is a feature rich note app for your Windows Phone 8 device. It does take a little while to get used to things simply because there is so many features and settings to customize your notes. The only thing I can think is missing is ability to set an alert for each note. There is a free trial version available for EasyNotes with the full version running $1.29. 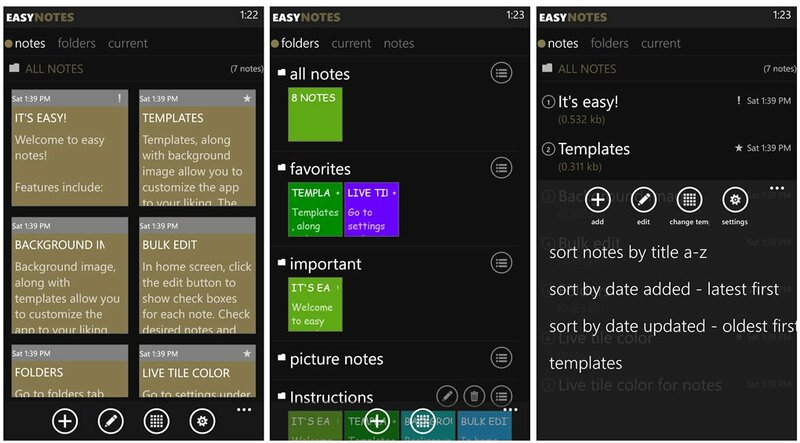 You can find EasyNotes here in the Windows Phone Store.